Sticky Chinese Belly Pork - Slow-cooked until meltingly tender and then finished with a sticky chilli glaze. Add all the slow cooked pork belly ingredients to a pan (not the glaze ingredients) I use a cast iron casserole pan like this <--affiliate link. Bring to the boil, then place a lid on, turn down the heat and simmer for 2 hours. Turn off the heat and drain the pork. You can reserve the liquid if you like (Perfect for a Thai or Chinese noodle soup). Chop the pork into bite sized chunks. Add 1 tbsp. of the oil to a frying pan, and then mix the remaining glaze ingredients in a small bowl. Heat the oil and add in the pork, salt and pepper, frying on a high heat until the pork starts to turn golden. Now pour the glaze over the pork and continue to cook until the pork looks dark and sticky. Remove from the heat and serve with some rice and green veg. Yes, you can make it up to the end of step 2 (where the pork is slow cooked and then drained). Then quickly cool, cover and refrigerate (for up to two days) or freeze. Defrost in the refrigerator overnight before slicing and frying the meat. You can also make the sauce ahead, then cover and refrigerate it up to a day ahead. Yes! Replace the soy sauce with tamari. I've done this several times and it works great. Replace the rice wine with sherry (usually gluten free, but best to check). Also make sure you use gluten free stock. 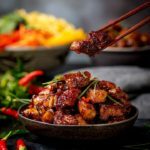 I haven't tried this with a meat-like alternative, but my Asian-style cauliflower wings make a great alternative. Yes, you can do the first stage in the slow cooker. Cook on high for 4-5 hours or low for 6-7 hours. Keep an eye on the level of liquid and top up with a little more if needed.